Alcoholism is the chronic consumption of alcoholic beverages. It is also referred to as alcohol dependence syndrome and defines the characteristic behavior of alcoholics, i.e. impaired control over drinking that leads to loss of control over one’s life. There are numerous causes of alcoholism. The leading factors usually associated with alcoholism are genetics and psychological and social factors. There is a growing amount of scientific evidence that suggests genetics play a major role in alcoholism. Studies done by the National Institute on Alcohol Abuse and Alcoholism or NIAAA have explored the possibility of familial transmissions of the disease and that alcoholism is not solely a result of environmental factors. The research is based on a behavioral pattern that significantly occurs in families with a history of alcoholism. In a study, a certain DRD2 gene is associated with alcoholism. However, the connection of an actual gene is yet to be verified as one of the main causes of alcoholism. In a study involving two pairs of twins nurtured by separate alcoholic adoptive parents, it was revealed that the incidence of alcoholism was dramatically higher in the pair of twins with an alcoholic biological father compared to the twins born of a non-alcoholic father. Incidence of alcoholism is also more likely to occur between identical twins, who share the same genetic components, compared to fraternal twins who share only 50% of their genes. Other similar scientific studies have shown that children of alcoholics are more likely to develop alcohol problems compared to the general population. The same children are also more exposed to environmental factors and are more at-risk to develop emotional and behavioral problems. Similarly, the prevalence of alcoholism in first-degree relatives is three to four times more compared to the general population. However, it must be noted that in these studies not all children of alcoholics become alcoholics. In addition, some twins who participated in the study and have a family history of alcoholism did not show symptoms or traces of alcohol problems. It cannot be concluded that the causes of alcoholism in families are purely by genetic components. Many studies have been conducted to know if alcohol is hereditary. Scientific evidence is presented, and more data are expected to follow. However, the actual genetic component is yet to be identified. Moreover, not all studies show the connection between alcohol and certain mental or affective disorders. Most of the genetic studies are also conducted in animals. Nevertheless, it is safe to assume that genetics play a role in alcoholism, by how much is yet to be determined. Even if a person has a long family history of alcoholism it does not mean that he or she will become an alcoholic. Alcoholism remains to be a result of environmental and genetic factors. Genetics only increased the risk of being one but it doesn’t have to shape a person’s destiny. If anything, it can lead to early prevention instead of becoming an obstruction. Many alcoholics drink alcohol to improve their moods and restore their spirits. However, heavy alcohol consumption can deplete the stores of serotonin and dopamine, two neurotransmitters that produce feelings such as euphoria and a sense of calm and happiness. Even so, alcoholics continue to drink alcohol in the belief that it can reinstate their sense of well-being. Like other illicit drugs and substances, alcohol can cause psychological dependence. It affects the central nervous system and acts with certain neurons or nerve cells in the brain. The neurotransmitters in the brain are also affected with long-term alcohol consumption. When a person suddenly stops drinking alcohol, these neurotransmitters can overexcite the nervous system and cause agitation, which can lead to palpitations and high blood pressure. An alcoholic resumes drinking to prevent these withdrawal symptoms from occurring. One of the main causes of alcoholism is binge drinking to forget life’s struggles and problems. Many alcoholics drink in the hope that they will be able to forget their problems by drinking large quantities of alcohol. A person who drinks irresponsibly may develop alcohol tolerance in the long run. The more a person drinks, the more he or she becomes more alcohol tolerant. This can lead to greater alcohol consumption, and then later, to alcoholism. Depression is another psychological disorder being studied as one of the causes of alcoholism. Alcoholism and depression can coexist. This is obvious among alcoholics who demonstrate various mood swings when drunk. Some alcohol dependents and alcohol abusers are also more affected by acute withdrawal symptoms, which can then lead to anxiety and depression. The interaction of alcohol and affective disorders may be linked genetically or may exist as a result of the other. For example, a person with a case of anxiety or depression disorder may drink alcohol to cope with the condition. Similarly, an alcoholic may display symptoms of depression as a result of drinking. “…alcoholism and depression manifest phenotypes or related traits, which can be linked to the same genes” The Collaborative Study on the Genetics of Alcoholism (COGA) found that alcoholism and depression manifest phenotypes or related traits, which can be linked to the same genes or DNA. Because depression is a genetic disorder, it is possible that alcoholism is genetic as well. The study showed significant evidence that a certain chromosome may influence people with the said chromosome to be more predisposed to alcoholism and depression. COGA researchers have also discovered that certain brain wave patterns are shaped genetically, which can be one of the causes of alcoholism among people who are psychologically unstable. Another research presented by the National Institute of Mental Health (NIMH) also reported that alcoholism is twice as prevalent in families with a history of affective disorders. The prevalence of alcoholism is raised sevenfold among female family members with major affective disorders. 1,900 died from vehicular crashes or accidents. 1,600 died as a result of homicide. remaining people died from other injuries, such as burns, falls, and drowning. The Substance Abuse and Mental Health Services Administration (SAMHSA) also reported in 2011 that 26.4 percent of persons aged 12 to 21 consumed alcohol drinks in the last 30 days. Binge drinking in this group is 17.4 percent. Alcohol is prevalent among young adults, and it is more accepted and pervasive compared to illicit drugs like marijuana and over-the-counter medications. According to NIAAA, a young person drinks because his or her friends drink alcohol. It is a manner of adapting to their environment and as a way to confirm their increasing independence. It can be easily concluded that one of the strong causes of alcoholism among young people is peer pressure. Teenagers are more vulnerable to peer pressure, as they are still learning to control their behaviors and impulses. They often find it hard to resist peer pressure especially from older and more experienced people. It is important to guide children and teenagers about the positive and negative impacts of peer pressure, as well as the consequences of underage alcohol drinking. According to the data presented by the Center for Disease Control and Prevention (CDCP) in 2010, 50.9 percent of people aged 18 and above are regular alcohol drinkers, while 13.6 percent are infrequent alcohol drinkers. Overall, 23 percent of adults aged 18 and above drink more than five alcoholic drinks in one day. Almost 60 percent of men are current regular drinkers. It is also reported that more men are former regular drinkers, while women tend to be current or former drinkers. Peer pressure often persists in adulthood. Sadly, many adults still carry the wounds and scars from their younger years. These same people often make decisions for the purpose of gaining respect from their colleagues and superiors. They still go on binge-drinking nights and sprees to be tagged as popular, hip, and cool. 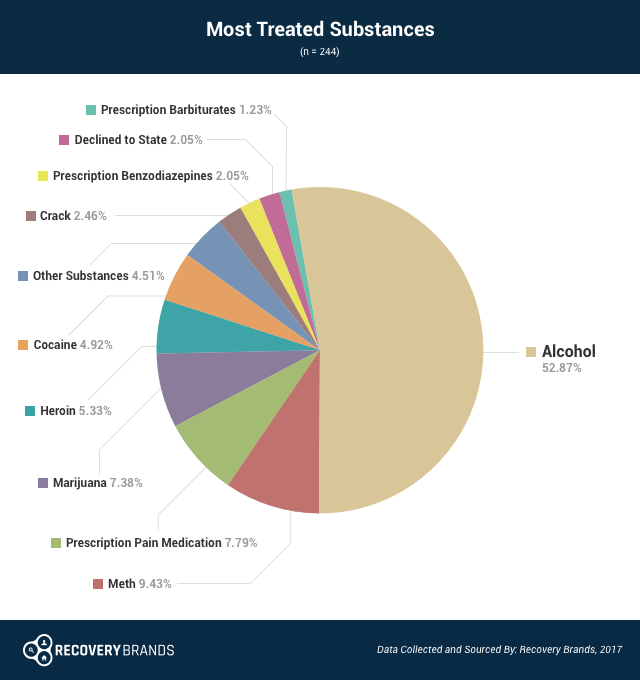 Ethanol, or alcohol, is abused more than any other drug among those engaged in treatment, as a 2017 survey by Recovery Brands revealed. Out of all the survey responses, nearly 70% of people went to treatment because of an alcohol problem, and a surprising 52.87% of respondents sought the most treatment for alcohol abuse. Despite the wide variety of abused substances individuals seek treatment for, ethanol seems to cause the most widespread damage. Fortunately, help is widely available. Call our helpline at 1-888-287-0471	Who Answers? to begin recovering from substance abuse today. Alcohol abuse is continued consumption of great amounts of alcohol even if it is causing personal, social, and financial problems for the drinker. Alcohol dependence, on the other hand, is a result of long-term alcohol abuse. Alcohol dependence is the continued drinking of alcohol to prevent withdrawal symptoms. Alcohol dependents or alcoholics often develop progressive tolerance to alcohol, which can lead to severe health problems. Alcoholics often display four symptoms. This includes craving or the strong desire to drink, loss of control or the inability to stop drinking once it has begun, physical dependence or withdrawal symptoms, and tolerance or the need to consume huge amounts of alcoholic drinks to feel the defined effect of alcohol. Yes, alcoholism is a disease. It is categorized as a dependence syndrome by the World Health Organization. It can develop after repeated alcohol abuse. Are there any medications to treat it? There are currently three medications indicated for alcoholism: disulfiram, naltrexone, and acamprosate. These medications help alcohol dependents in reducing their alcohol cravings, prevent or reduce withdrawal symptoms, and maintain sobriety.Other types of drugs like benzodiazepines can also help relieve harsh withdrawal symptoms induced by alcohol detoxification. These drugs can help control nausea, sweating, shakiness, and other symptoms. Will these medications work for anyone addicted to it? Some medications may work for alcohol dependents, while other alcoholics may require alternative medication. This usually occurs when an alcoholic develops certain diseases due to alcohol abuse. A different alcohol medication is also prescribed for people with psychological disorders. The medications can also change depending on the causes of alcoholism. Are there other treatments ? Chronic alcohol abusers and alcohol dependents can choose to attend an inpatient or outpatient rehabilitation center to recover completely from the disease. Alcohol rehab centers provide unique programs for each patient to be able to address the patient’s individual needs. People with pre-existing physical or mental illness are also recommended to enter an alcohol rehab center so they can get special medical attention. An alcoholic who does not want to enter a rehabilitation center can join a local support group like Alcoholics Anonymous. Who are the groups of people more likely to develop the disorder? Alcoholism is a disease that cuts across race, nationality, and gender. In the United States alone, adults aged 18 to 29 have the highest percentage of alcohol problems. Teenagers are also at risk, as the alcoholism trend among younger people seems to increase every year. The elderly aged 65 and above show the lowest percentage. Alcoholism is a treatable disease, but it can result in severe health problems if ignored. Reach out to a free helpline where you can get information about the causes of alcoholism, options to recovery, and various programs for addiction treatment.